IIM Ahmedabad's Extended Promotional Brochure. Bulll Crap. This might be a best-seller with over 300,000 copies sold and translated into 8 languages. But it failed to ring a bell with me. I tried reading it several times but after a while I had to put it down. The book is annoying. 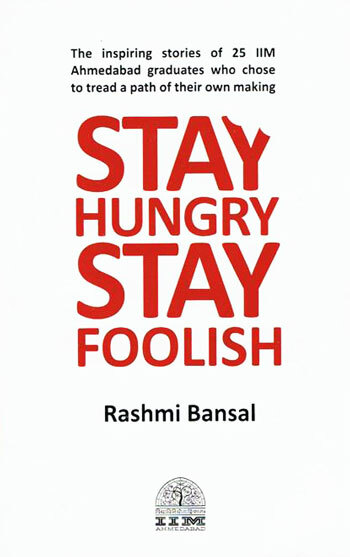 Stay Hungry, Stay Foolish – what a waste of title! It should have been named – Extended Promotional Brochure of IIM Ahmedabad. It’s a collection of interviews of 25 entrepreurs who are, primarily, IIM Ahmedabad alumni – a very wrong message to give out. Either that or Rashmi was lazy enough to just interview entrepreneurs whom she had easy access to, given she is an IIM Ahmedabad almuini herself. Then she is asking all the wrong questions – instead of letting the great minds tell their story and shape an opinion she seems to have a set pattern in mind in which she is trying to fit in every story. Oh the irony! Thanks to that, the book gets pretty monotonous and boring very soon. I ended up skipping everything and just read “Advice to Young Entrepreneurs” section of every interview. That’s a gold mine! Other than that Shantanu Prakaash‘s interview is my favorite he broke Rashmi’s set pattern many times. The list of email address of these entrepreneurs at the end of the book is useful as well. Rest is just boring, monotonous, fit-in-my-mindset structure with reporting of who was late for what. I don’t see it making a real difference anywhere, not in me at least. This isn’t about the entrepreneurs; their stories are great – the book is crap.